*#185 Marco Scutaro – Card image is of Gregor Blanco. 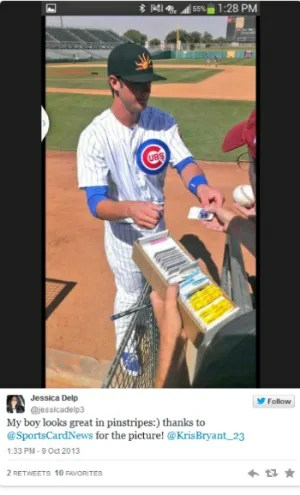 **Note: Kris Bryant Autographs appear to be short printed compared to other players. This is typical of past Bowman products, where certain autographs are at times short printed. In addition, there appears to be no Refractor autograph version – serial numbered #/500. The Kris Bryant autographs are redemption cards, that expire 4/30/2017. I also find it interesting that I’ve had no problem finding Bryant on the baseball field, watching him play several games in person, yet Topps had trouble getting cards signed on time. You can assume there were some complications in their agreement with Bryant ($$$$$$), as he was short printed and a redemption. The Bryant autographs are some of the few redemption cards in the entire set, an improvement from past Bowman releases. All 5 Lucky Redemption Cards are for Kris Bryant Autographs. Only one card per envelope, mailed separately, postmarked by July 30, 2014 and received by August 6, 2014. The 1st 12 collectors that complete the Toronto Blue Jays Bowman base set and tweet a picture of all the cards (with a hobby shop owner) to @UniversalDst with the hashtag #Iwantin, wins a random signed Blue Jays baseball. Universal is a Wholesale Distributor of sports cards. View a list of distributors here.